Caring for your skin isn't complicated, as a matter of fact it�s quite simple. Maintaining a healthy lifestyle is key to having beautiful black skin. But the real secret to having great skin is to accurately know your skin type and how to care for it accordingly and have a basic skin care regimen in place. Let's take a look at skin types and conditions and how to care for them. When I was training as an Esthetician, I was told that we hadn't had normal skin since we were babies. That was a jolt to my ego because I thought I had normal skin. Normal skin is neither dry nor oily. It's usually free of blemishes but it's possible to have blackheads. Cleansing � Using a gentle water or creamed based cleanser will be the best regimen for normal skin. 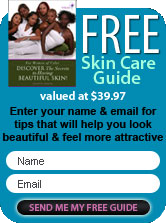 It allows you to cleanse your skin without stripping the natural oils from your skin. Toning � Rosewater, lavender or orange floral waters refresh and further cleanse your skin. Moisturizing � A very light and protective cream that's designed to seal in moisture is good for normal skin. Avoid at all cost a cream that�s too heavy because it will cause oiliness. Special Treatments � An herbal facial once a week will help cleanse your pores. Alpa or beta hydroxy acid treatments twice a week, will help to minimize fine lines and smooth your skin. Typically you�ll find medium �to-large pores in your T-zone area and possibly on your cheeks, shoulders, neck, chest and back. The appearance of slick and shiny skin an hour after cleansing is the result of overactive sebaceous glands. You may or may not be prone to acne and pimples but your pores can easily become clogged. Because oily skin is well lubricated, it is not prone to fine lines and wrinkles. Cleansing -Using a cream/milk based, gel or clay cleanser that does not dry out your skin. The goal when cleansing oily skin, is to remove the excess oil but without stripping the protective barrier. Moisturizers � depending on the degree of oiliness, you may not need a moisturizer. Special Treatments � By using a clay masque or exfoliating scrub at least twice a week, you will discourage the formation of blackheads, minimize breakouts and reduce the appearance of enlarged pores. Dry skin is the lack of natural oil and moisture, for these are the basic requirements needed for the glow of healthy skin. Without the natural oil and moisture, your skin will have a flaky, scaly and rough texture. Dry skin will develop lines and wrinkles faster than any skin type and you will age prematurely. Cleansing � by using a cleansing milk or cream that's rich in moisture twice a day is a great beginning. Stay away from soaps, because soaps are drying. Toner � For dry skin the well-known classic of rosewater and glycerin makes the perfect toner to help in hydrating your thirsty facial skin. Moisturizing � It's important to use a rapidly absorbing cream for your face that will provide a barrier against the environment that dries your skin. Special Treatments � Using a masque that hydrates and moisturizes your skin once or twice a week as needed is a great beginning. This is the result of two skin types, dry and oily, occurring on the same face. In general your T-zone will appear oily with enlarged pores, visible blackheads and possible acne breakouts. Your cheeks and neck will feel dry and tight with some flakiness. Cleansing � A water or milk based cleanser used twice a day will deep clean and refine your pores while hydrating and protecting your skin against dryness. Toning � You use toners to remove excess dirt and cleanser, hydrate and normalize your pH level, rosewater toner is my choice for this skin type. Other alternatives are German chamomile, orange and lavender floral waters. Moisturizing � Use a light moisturizer on your oily area and a nourishing cream to the drier areas when necessary. Special Treatments � On combination skin, your pores tend to clog easily. The dead skin and dirt needs to be exfoliated on a regular basis. A Jojoba Facial Scrub twice a week is a gentle yet effective way of removing dead skin cells. You can also give yourself a facial steam once a week adding lavender and rosemary essential oil to the water, thereby removing impurities from your pores. Don't get overzealous in trying to over moisturize, over exfoliate or over cleanse for that matter. But in analyzing your skin and learning your skin type, whether it's from your or a skin care professional, a basic skin care regimen is what you will need to keep your skin in great health.